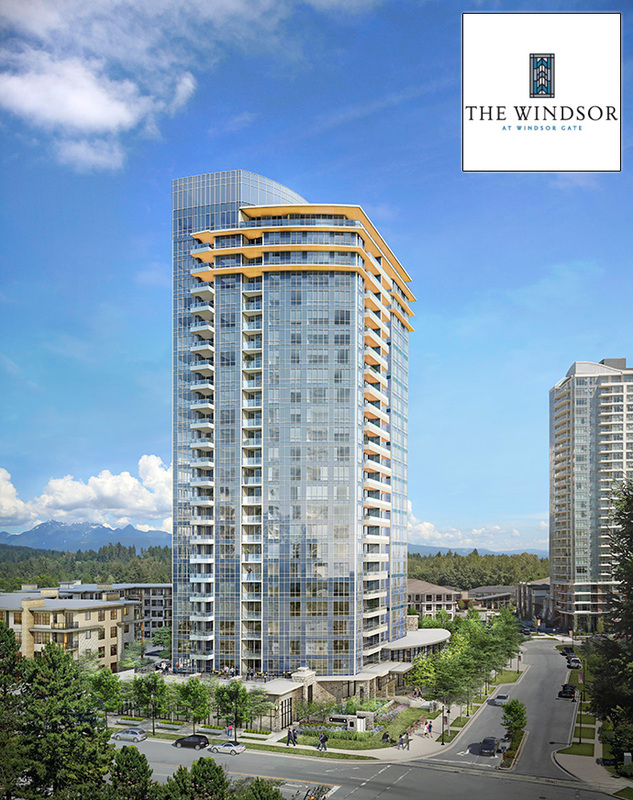 Located at 3096 Windsor Gate Coquitlam, The Windsor Coquitlam condo project will feature a spectacular new high-rise tower in this master planned Polygon community. Rising above beautiful Glen Park, The Windsor at Windsor Gate Coquitlam condo high-rise will have dramatic architecture inspired by the late Frank Lloyd Wright plus a new collection of spacious and boutique residences. Two bedroom apartment residences are priced from $319,900! High-rise living in this master planned Polygon Windsor Gate community is now here near Coquitlam Town Centre real estate market. Some of the details are still in their early stages, but what we do know is that the preconstruction Coquitlam Windsor Condos will feature 2 bedroom residences that have open floor plans and sophisticated finishes. They will have expansive floor to ceiling high windows and some units will have spectacular North Shore mountain or valley views. There are 3 colour palettes to choose from (all professionally designed and selected) and they will create an elegant and high-end backdrop to your interior decoration and styles. The main living areas will come with wood style laminate floors and the kitchens will be both modern and elegant, with polished engineered stone counters and glass tiled full height backsplashes. The kitchens will also be finished with smooth counters, premium stainless steel appliance set by KitchenAid as well as custom designed cabinetry and built in pantries for lots of storage space. The beautiful bathrooms will be refined and will feature luxurious finishes, oversized vanity mirrors, recessed lighting and premium fixtures. The Windsor Coquitlam presales condos are located at Windsor Gate in Coquitlam Town Centre community where you will find a world of possibilities and opportunities. From natural amenities at Lafarge Lake and the banks of the Coquitlam River to top ranked schools, shops, grocers, big box retailers, art venues and eateries just minutes away, The Windsor Coquitlam condos are also just steps away from the future Evergreen SkyTrain Line (which may be renamed before opening in a couple of years). More information is online at www.polyhomes.com. Here are a few interesting and exciting features of the newest addition to the Coquitlam Windsor Gate community. 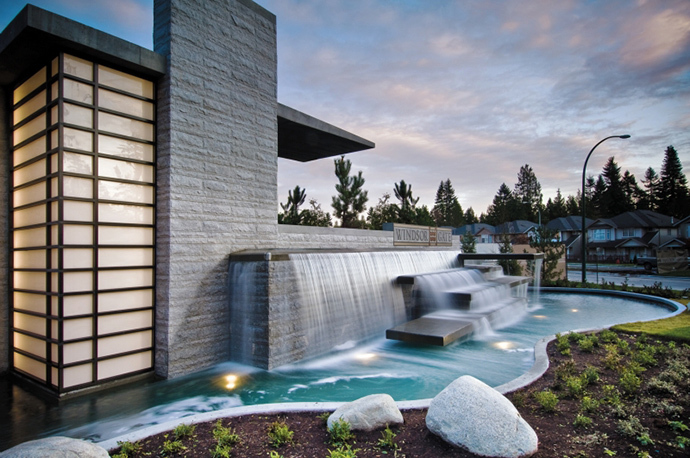 The Windsor Coquitlam condo tower will be inspired by the late Frank Lloyd Wright and will have a memorable water feature out the front with lush professionally landscaped grounds and a graceful entryway that is warm and stylish. The lobby entrance will feature a custom fireplace and comfortable seating lounge area. As with all previous phases of the master planned Windsor Gate Coquitlam community, residents at The Windsor Coquitlam condo tower will have full access to the exclusive Nakoma Club and all of its over 18,000 square foot amenity space. There is even a dog grooming facility. The signature homes at the presales Coquitlam The Windsor condo tower include contemporary solid core entry doors, two panelled Carrera style interior doors, 3 understated colour schemes and wood style laminate floors in main living spaces. As well, the bedrooms have plush carpeting and the low-E windows are oversized and offer great views and lots of light. The sophisticated kitchens at The Windsor Coquitlam condos include a superior stainless steel appliance package (with 30” wide KitchenAid gas cooktop and self cleaning wall oven, KitchenAid microwave with space saving hood fan, energy efficient touch controlled KitchenAid dishwasher that is integrated and a modern 15.5 cu ft Liebherr fridge with bottom mount freezer. Also, the kitchens at the Windsor Gate Coquitlam Windsor condo high-rise will come with stylish and modern flat panel cabinets, designer polished chrome pulls on lower cabinets and polished engineered stone counters with glass tiled backsplashes. There are under mount double sinks with single lever faucet (with vegetable spray) in addition to laminate wood style floors and soft close cabinet, sleek under cabinetry lighting and built in recycling bin. The luxurious bathrooms at The Windsor Condos in Coquitlam’s Windsor Gate community come with refined details like vanity mirrors (oversized) with recessed lighting, contemporary soaker tub with chrome fixtures, oversized shower with rain shower head in ensuites and most second bathrooms in addition to elegant natural imported marble counters, marble backsplashes, large format porcelain tiled flooring, flat panel floating custom cabinetry with chrome pulls and dual flush water closets. There are stacked washer and dryer in all homes in addition to modern wiring. 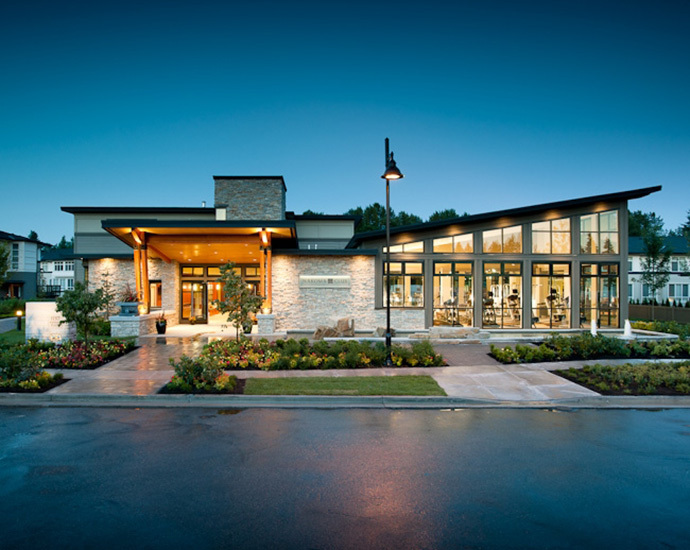 As with all other phases of the master planned Polygon Windsor Gate community, The Windsor Coquitlam condo residents will have access to the exclusive 18,000 square foot Nakoma Club at Windsor Gate private clubhouse. The Club will feature such things as a beautiful outdoor swimming pool, landscaped terraces, full fitness centre, gym, screening movie room, great room lounge, guest suite and a resident concierge. In addition to the Nakoma Club, The Windsor at Windsor Gate condo owners will also have over 3,000 square feet of exclusive private in building amenities to enjoy. ABOVE & BEYOND > Coming Soon to the master planned Coquitlam Windsor Gate by Polygon community! Introducing The Windsor Coquitlam condos, the newest residences at Polygon’s exclusive Windsor Gate community in Coquitlam Town Centre. A collection of two bedroom concrete high-rise homes with views of the surrounding mountains and neighbouring Glen Park, The Windsor Coquitlam condo high-rise residences will rise dramatically from the tree-lined streetscapes below while still being conveniently close to the SkyTrain line, Coquitlam Centre shopping, entertainment, dining and services as well as lively and exciting cultural venues. The Windsor Coquitlam condos at Windsor Gate community will have underground parking, security/service by an on-site resident manager, rainscreen envelope technology, exclusive key fob access, lock-off control access to each floor and the 2-5-10 Travelers Insurance Company of Canada guarantee. The Windsor by Polygon: $7,500 Savings For First 30 Buyers!